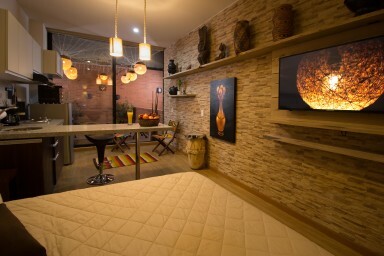 This unique home and open air terrace will allow you to experience the rich culture of a Pre-Columbian era from all over the Americas, so you can see & feel the textures, designs and patterns of a culture before significant European influences, combined perfectly with all the necessities for a comfortable stay in Bogotá. Colombian crafts are world-famous, which is why the majority of the furnishings in the apartment was created by various local craftsman, 100% hand made. The workspace, the bed, shelves, wall furnishings and decoration are all hand-made. A home-made touch to make you feel right at home. Easy access to public transport "Trasmilenio - Calle 57"